Leading research and advisory company Gartner describes big data as: “…high-volume, high-velocity and/or high-variety information assets that demand cost-effective, innovative forms of information processing that enable enhanced insight, decision making, and process automation”. In other words... lots of information, with lots of impact, fed from lots of sources! Big Data is essential to staying one step ahead of the competition - it allows recruiters to create hiring campaigns which: yield better results; lead to better decision making; create a more detailed understanding of the candidate; and deliver unique insights into job search behaviour and trend forecasting. In response PMP have moved to a digital hiring model which enables us to capture pivotal intelligence to support the delivery of best in class service to our clients and candidates. At PMP we have multiple data sources which influence the way we operate: internet data taken from social media or website metadata; transaction data whereby our client and candidate is the customer; administrative data which is anonymous detail derived from poll or survey participation; and commercial data pulled from statistical forums such as the Office For National Statistics. Last year we launched Cordant Connect, which not only transformed the candidate journey, and revolutionised the recruitment process, but also allowed us to gain detailed insight into applicant behaviours, motivations and expectations. Connect started life as an onboarding system. Job seekers are diverted from job boards, or our brand website, to Connect where they fill in their personal details - this information is then fed into our 8x8 dialler at the National Resource Centre. A member of the resourcing team contacts the applicant to book them into a hiring event, and if required supports them through the Connect stages to ensure all required details are completed. A booking confirmation, which includes time, location and travel information, is sent to the individual by sms. Once at the hiring event verification of all documentation is carried out and the attendee is processed for interview. But through further development Cordant Connect now interacts with big data and other technologies to give essential insight into our audience. Data from Connect is fed into dashboards which enable users to track information, monitor performance, dig into contract intel and identify potential operational issues before they happen. Connect-MI visually tracks, analyses and displays key metrics to help management teams monitor the health of a contract, department or specific process. Connect-MI delivers insight which supports wider recruitment strategies and forecasting, other key features include: more effective management; time efficiency through reduced data entry duplication; consistency across all reports; greater visibility across multiple platforms ; quicker turnaround of ad hoc reporting requests, immediate access to MI on KPIs; trends and predictive analytics; alerts and deadline reminders. At PMP we’re committed to 100% transparent reporting and in today's competitive market we recognise that recruitment businesses need to cultivate a data driven culture. Connect-MI gives clients and stakeholders access to versatile, accessible and impactful reports which add value to any contract. With the dawn of big data many believe that surveys will become obsolete, however asking people about their feelings, beliefs, motivations and concerns generates more authentic information than big data can provide. 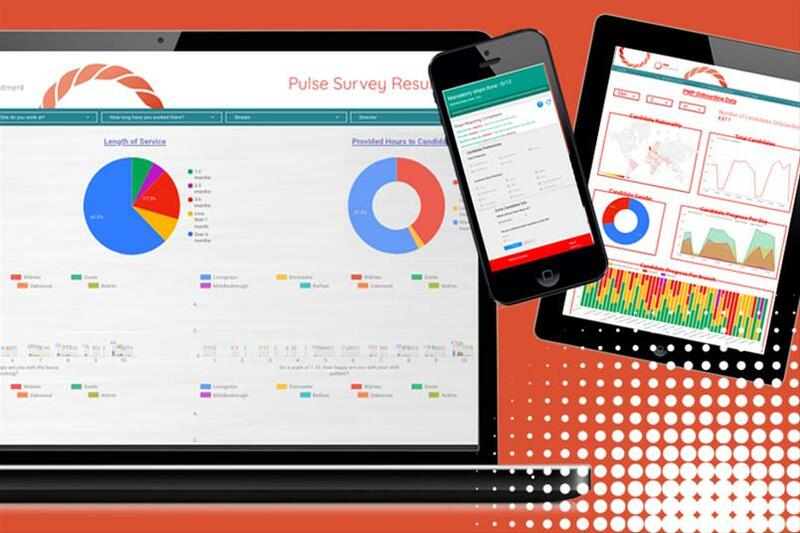 At PMP we give our people, both temporary and permanent, a voice and regularly gather feedback through Connect Pulse Surveys (PS). Each survey is made up of non-complex questions which give us insight into the views and opinions of the entire workforce, and with Net Promoter Scoring® we can measure the experience of our colleagues, and clients, to ensure we continually improve. Connect-PS allows us to ask new kinds of questions, track feedback and reach key populations quickly - meaning we can gauge popular opinion reactively. The market for authentic information drives business innovation and the delivery of best practice. The information fed from Connect-PS not only allows us to react and respond to any issues in real time, but also generates a 360 view of colleague experience which supports transformation and positive change. Connect’s education platform features custom built e-learning modules which are framed around the requirements of the multiple roles within our business. Connect-ED allows us to monitor engagement and track results for each user meaning we can measure employee performance, identify gaps in learning and recognise the shining stars. This insight also helps support individuals who may need refresher training or further investment from the business. The data created from Connect-ED means that our business, and our clients, can view live information which demonstrates an individual's passion for succeeding, eagerness to learn and commitment to the role.